It’s cold and nasty in the mid-west today so I stayed inside and played in my sewing room. 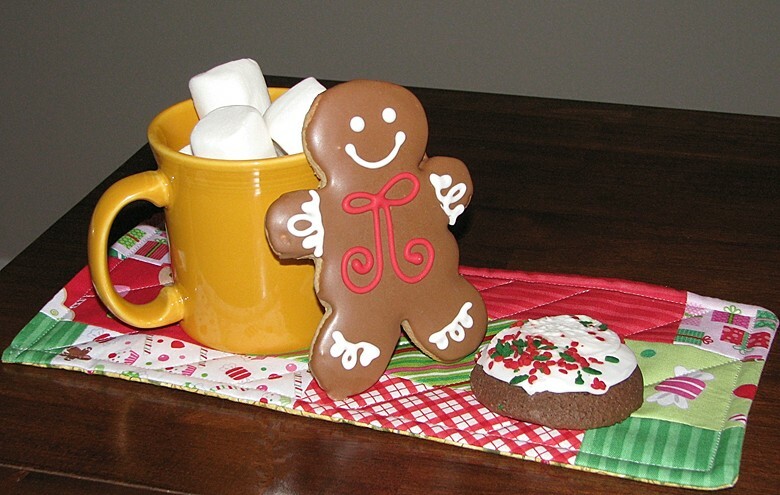 I came up with this mug rug project. Click on my tutorials link to see how I put this fast and easy project together. 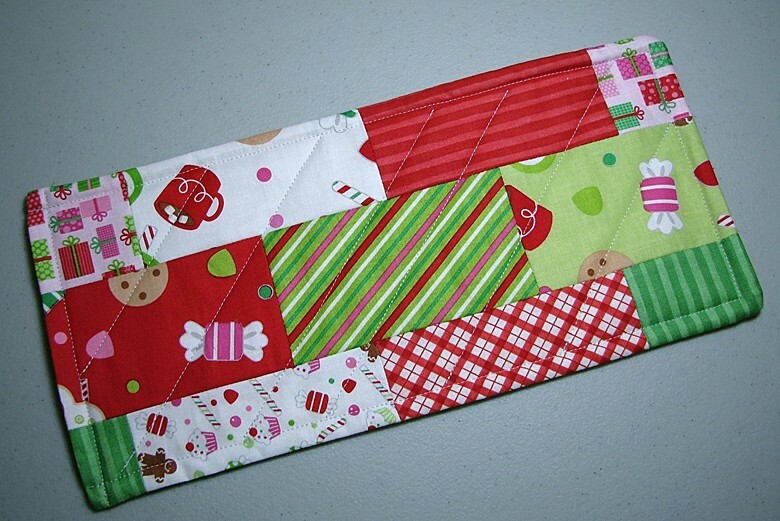 This entry was posted in Tutorials and tagged Christmas quilt, mug rug, quilt on December 8, 2013 by denmck. As mentioned in a previous post, I promised my daughter Erika that during my next visit I would bring her a new quilt. As hard as I tried I could not get it done before it was time to leave. With only the binding left to complete I loaded my suitcase with the quilt and required fabric and planned to finish it at her house. 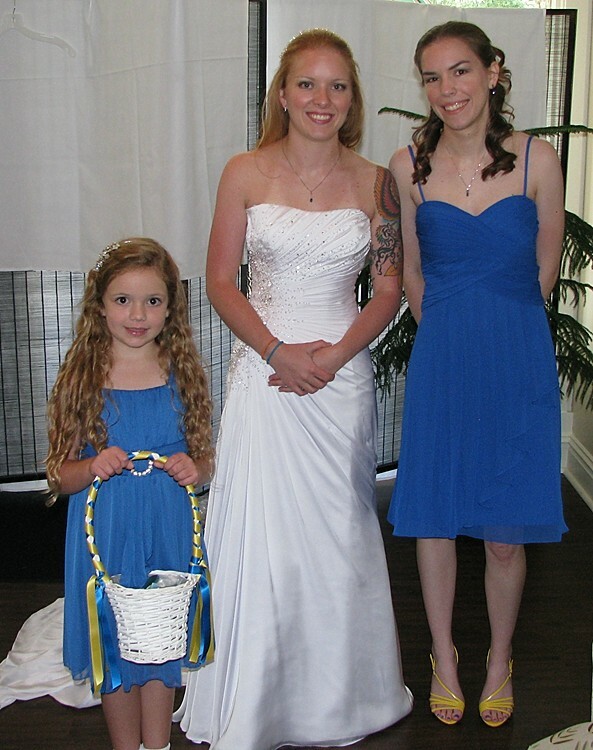 Erika inherited my “maker” genes and loved to craft things as a child and young adult. So when she got married and moved away I gave her my sewing machine, a New Home My Excel 23L. That machine was my reliable workhorse and was the first “good” sewing machine I bought when I began to seriously sew when my children were young. After they were grown the New Home started gathering dust, so I wanted Erika to have it. It brought back such great memories as I took it apart, dusted everything out, loaded up my thread and started sewing my binding. I forgot what a great straight stitch that baby could make! Still going strong after at least 15 years; probably more. 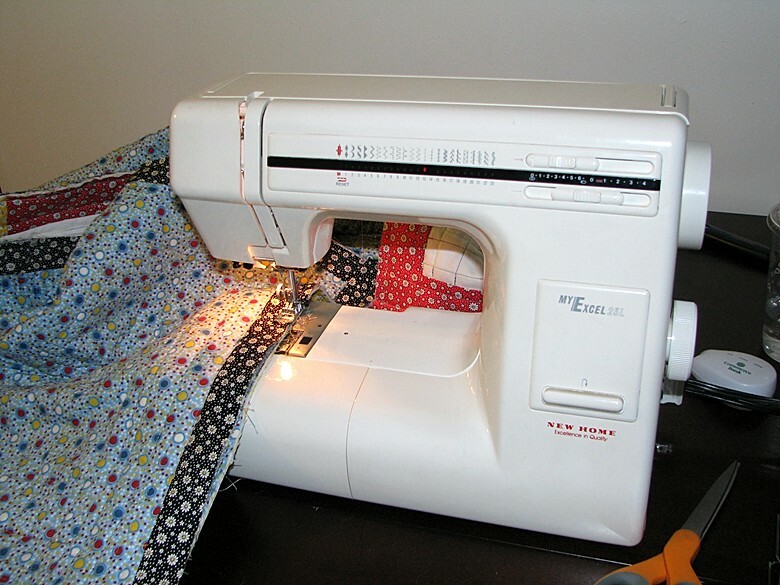 This entry was posted in Projects and tagged Nw Home, quilt, sewing machine on October 18, 2013 by denmck. This quilt has always been intended for daughter # 2 (the matron of honor) who was gifted with a small lap quilt last Christmas and has been asking for a bigger one. I’ll be visiting her in October so I’ll finish this up over the next week or so and finally, personally deliver it! I have an idea that’s brewing for the newlyweds as well and will post that soon. Hope everyone has had a great spring and summer! 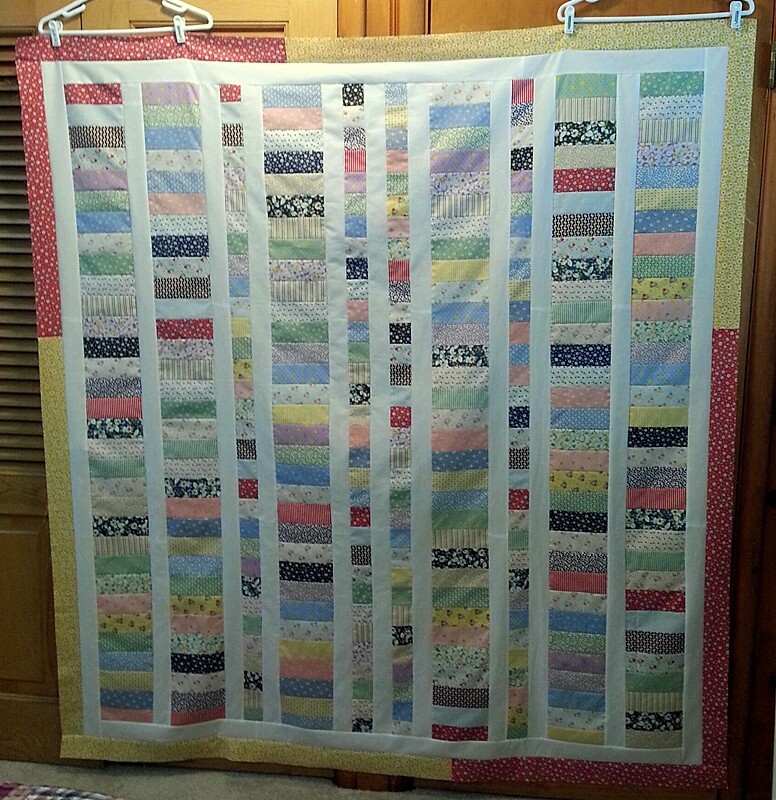 This entry was posted in Projects and tagged jelly roll, moda fabric, quilt on September 22, 2013 by denmck. Long time no posts! I let life get in the way of updating my blog and I apologize to anyone following. 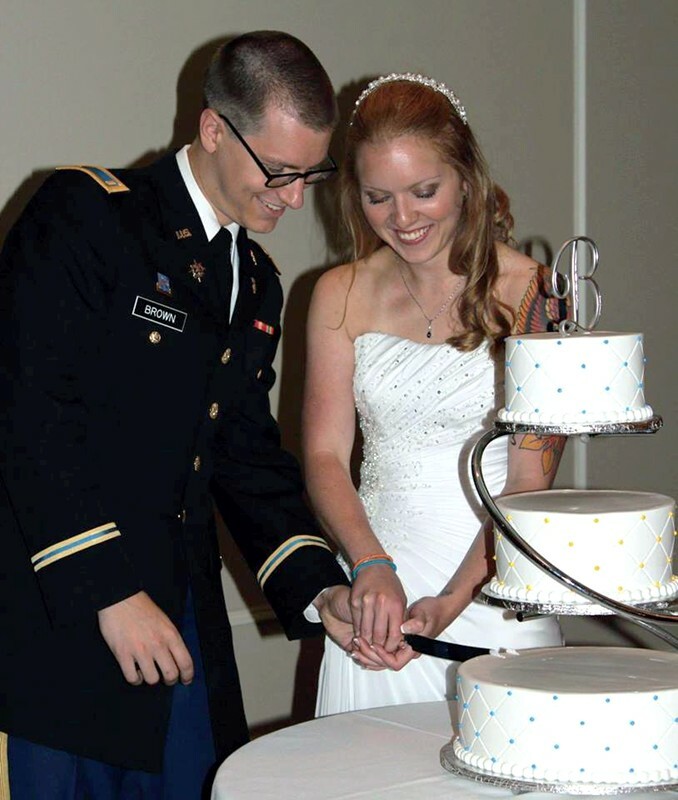 Changes at work, planning a wedding for my daughter, no quilting time, etc., etc…. 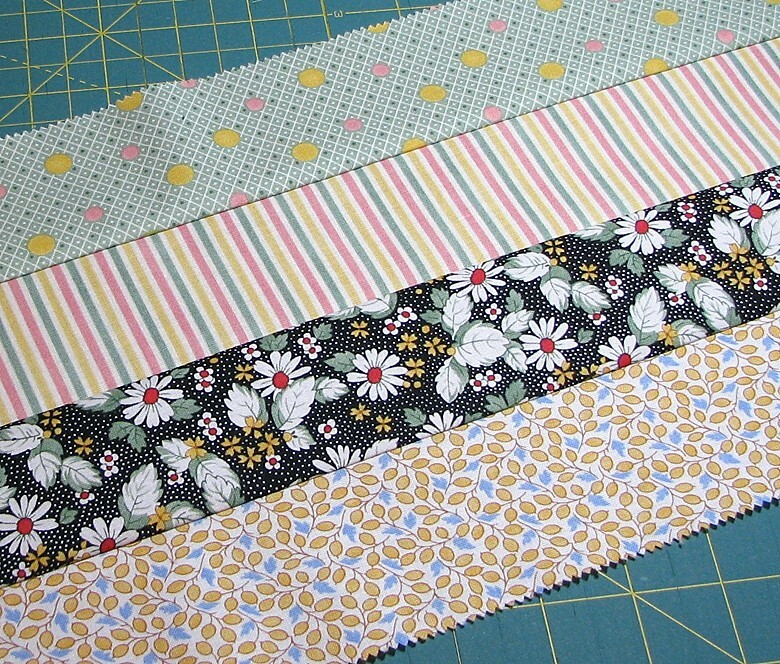 I picked out four strips from the Moda jelly roll that I thought complemented each other but also contrasted in value (darks and lights), then sewed them together along each long side with a 1/4″ seam. Then I sub-cut each 4 strip set into 5 – 2.5″ wide sections (the “blocks” are 2.5″ wide by 8.5″ long) and 5 – 6″ inch wide sections ( the “blocks” are 6″ wide by 8.5″ long). This leaves you with very little waste. 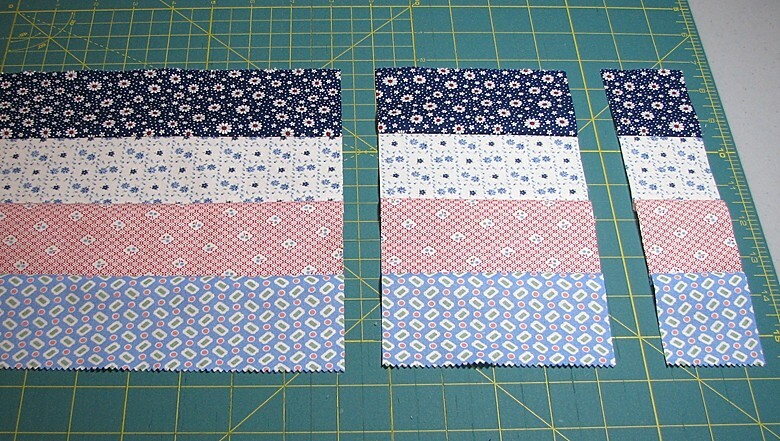 I continued to match up and sew together sets of 4 strips (ended up with a total of 10 – 4 strip sets) and sub-cut each set into “blocks” as above. Now the fun begins! 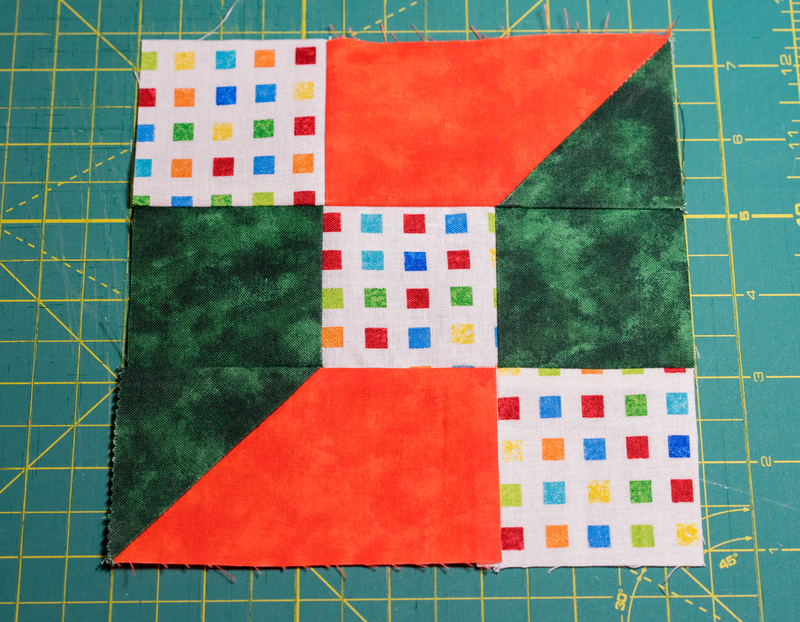 I then picked out 8 different 6″ wide blocks that I thought would look good together and began sewing them end to end, with a 1/4″ seam, to form one long strip. I did the same with the 2.5″ wide blocks. 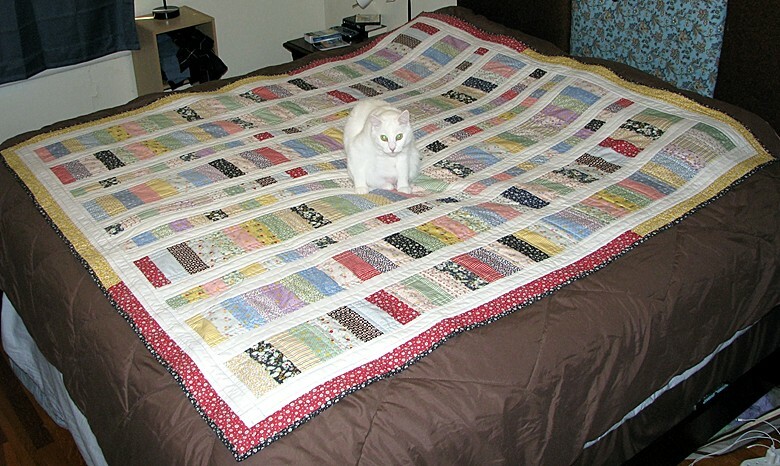 I continued to mix and match then sew together, end to end, sets of 8 – 6″ blocks, and 8 – 2.5″ blocks until I had 6 long strips 6″ wide x 64″ long, and 4 long strips 2.5″ wide x 64″ long. The plan was to sew one white solid 2.5″ strip between each of the print strips (using a 1/4″ seam). So now I just had to put each strip on my design wall and decide what king of striped pattern was pleasing to me. (I had some left-over 2.5″ blocks that I’ll probably use on the back). As you can see I don’t have all of the white strips sewn in yet, but this is going to be what I call a structured, scrappy look :). It was a fairly quick process to get it all together. I just tried to make sure I did not sew things together in a manner that had the exact same prints next to each other. I haven’t decided what kind of border to put around it yet, but I’ll be sure to post more when this is complete. I’ll try not to stay away so long! Thanks for reading. 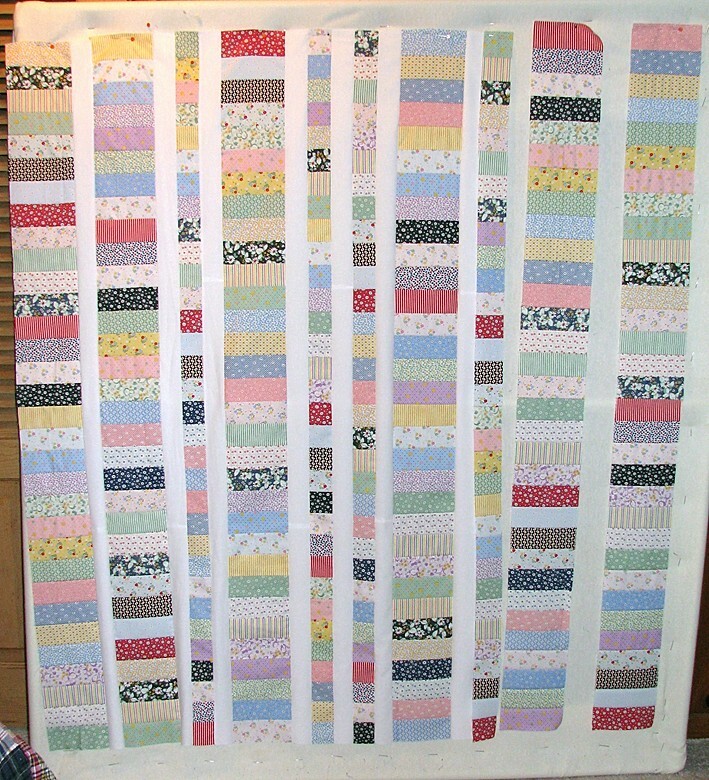 This entry was posted in Projects and tagged jelly roll, Moda, quilt on July 1, 2013 by denmck. 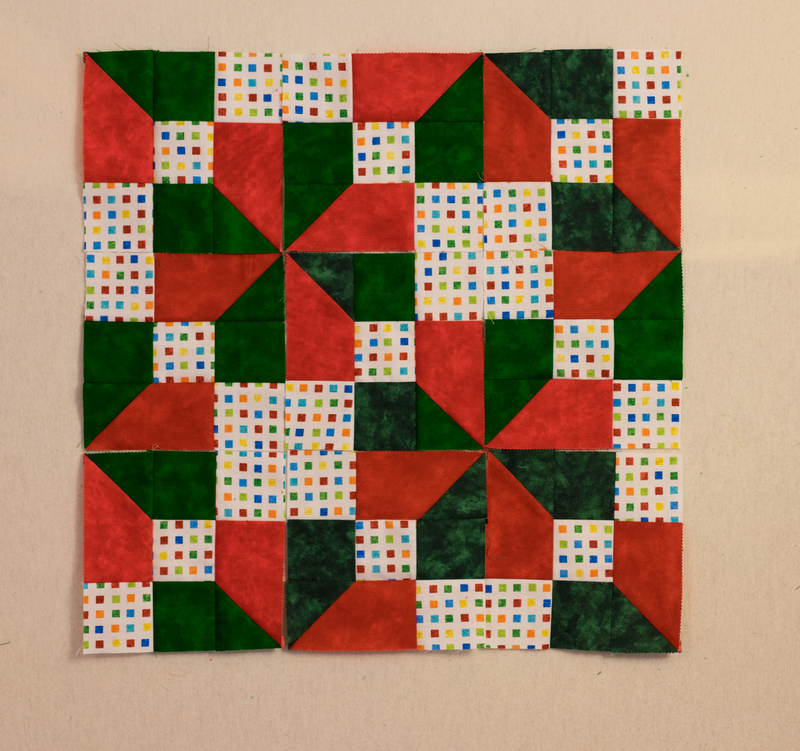 Check out my Projects and Lessons Learned to read about what I’ve learned when using half square triangles in a quilt. 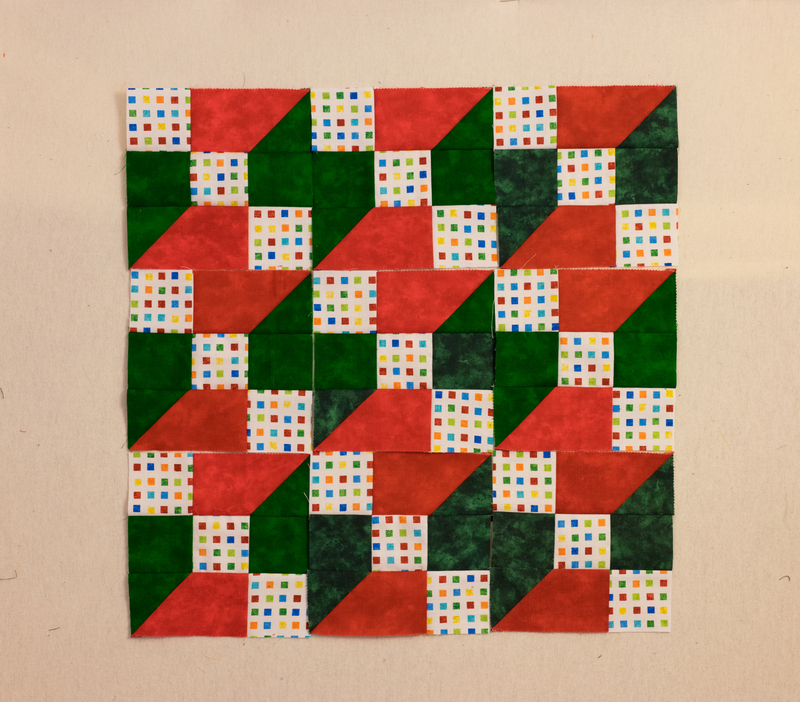 This entry was posted in Projects and tagged geometric quilts, half square triangles, HST, pressing quilt seams, quilt on February 12, 2013 by denmck.